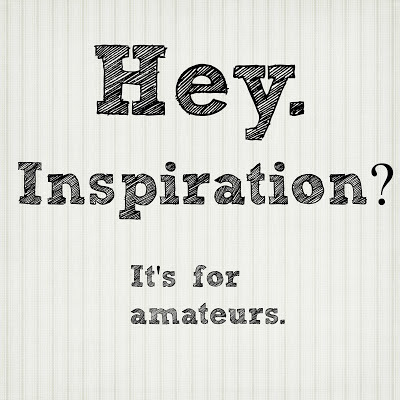 Inspiration is for amateurs. Don’t get offended. Don’t start a campaign against me. Just listen. All books start out with a spark of inspiration, right? An idea. The shred of a creative thought that eventually turns out to be the great American novel. That’s fine. That’s how I started writing State of Emergency: Inspiration. But what comes after inspiration? After the initial burst of energy hits you, then what? Do you pop the footrest out on your Lazy Boy and watch The Voice? Read another How to Write a Novel manual – because you’ve already read thirty-three this year and it still wasn’t enough? Motivate yourself with epic background music? 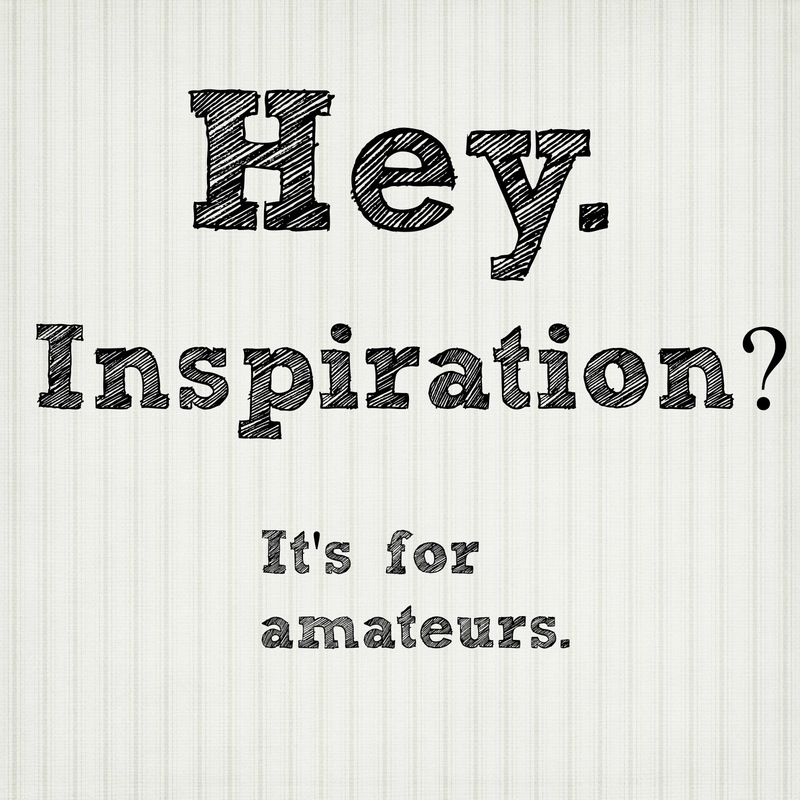 Whatever you do, keep this in mind: inspiration is for amateurs. If you wait for your muse to come to you, it’s quite possible that you will spend the next ten to twenty years sitting on your couch with an empty bag of potato chips, staring at the ceiling. Hmm. Was that crack there before? What about that water damage? Never noticed it until now. Don’t be a bump on a log. Get up. Inspiration, in many cases, will only last so long before it wears out. The long days and months – sometimes years – of creating a novel can be draining. Discouraging. By the time you get to that point, believe me, you’ll want to give up. It’s only natural. Because hey, if writing were easy, everybody would have penned a hit novel by now. But not everybody does. In fact, few people ever do. And the people that do usually have a lot of self-discipline and a lot of focus. Don’t wait for inspiration to get you through the dog days of editing and rewriting. When you’re looking at the 95th typo of YOUR vs YOU’RE, inspiration is going to seem far, far away. Something that keeps my business and writing in line is clear structure (which I’ve talked about before), but also, a schedule. You’re a writer. You’re a business. Act like one. · Get Writing. Let’s face it. As writers, we work in the business of words. We arrange them, play with them, and set them up to convey different meanings to different audiences. Words are to us what paint is to an artist. Without them, you have no product to sell, so you need to make sure that the bulk of your focus goes into writing those words. Set aside at least three hours a day for what I like to call Raw Content Creation. I do mine in the early morning hours of the day. It’s quietest then, and I do my best work in silence. Structure yourself. If you have a routine, you’d be surprised at how quickly you can control inspiration, rather than the other way around. Inspiration will start answering your call if it expects you to be in a certain place at a certain time. Work schedules are all about routine, so make your business the same. 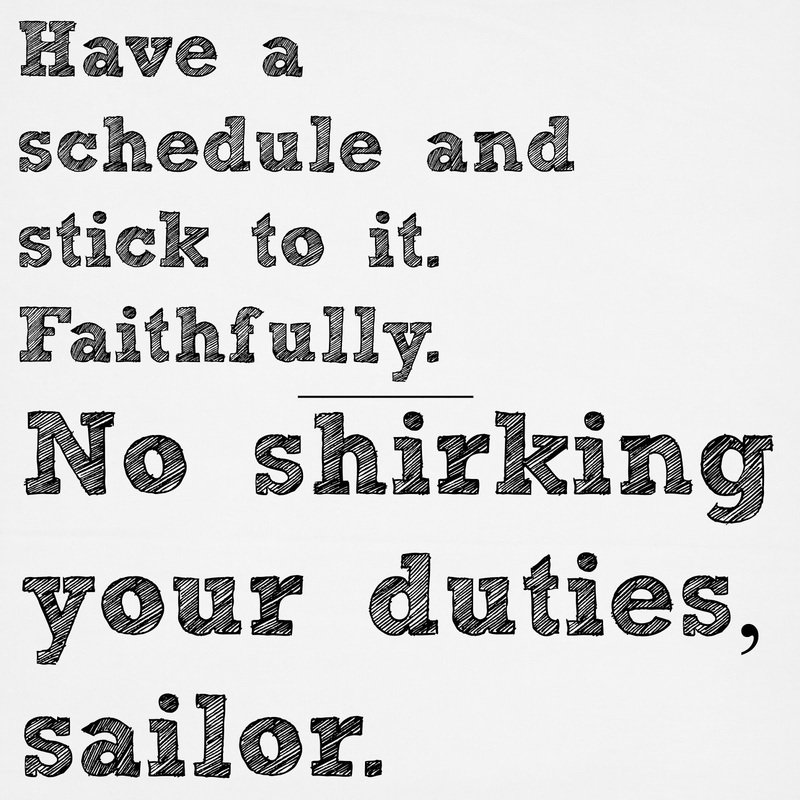 Have a schedule and stick to it. Faithfully. That means every day. 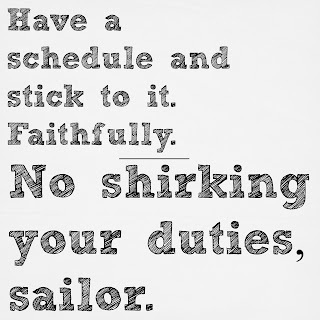 No shirking your duties, sailor. · Always improve. Honestly, I don’t edit the stuff I wrote all on the same day. I edit the previous day’s work and only focus on being free and creative with today’s writing. Taking a step back from the stuff you write today and correcting it tomorrow will allow you to see it with renewed clarity. Give yourself a break. I have a lot of other work that I do in between all this, which also allows me space between my writing and me. · Inspiration is for amateurs, but don’t waste a diamond. The purpose of a schedule and structure is to keep yourself disciplined in a very challenging and often discouraging line of work (just remember that the pros outweigh cons, people!). At the same time, you don’t want to waste inspiration when it does decide to pay you a random visit outside of your schedule. If that’s the case, catch a shooting star and put it in your pocket, as they say. Maybe that’s the little nugget you’ve needed to put the finishing touches on your story. · Stay focused. I’m good at multitasking. I can cook dinner, check Facebook, write my novel, edit a travel article, correspond with an interviewer, read the paper and clean up spilt milk on the kitchen floor all at the same time. Or something close to that. But you know what? Multitasking isn’t really all it’s cracked up to be. When you’re spreading out your efforts, something is going to suffer. Effort is often more effective when it is concentrated to a single area. Multi-tasking just allows you to do lots of things less effectively rather than doing one thing fantastically. Just remember that next time you feel the need to speed-dial your BFF and discuss celebrity gossip while you’re editing your manuscript. It’s not worth it. 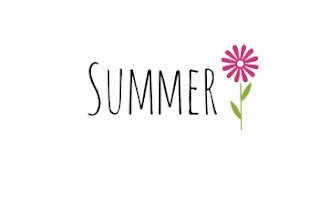 It’s really not. A professional will work in rain or shine. A professional will show up to work even if he doesn’t want to. Show up to work. Every day. There’s nothing wrong with taking some time off, but remember: it’s harder to get into a routine than it is to get out of it, so make sure you don’t stray from the path. Keep your goals firmly in mind. Go out and grab them. Make them yours. That’s the American dream, after all.